That was a pretty good team (esp #31) and season. The 1965 team was a excellent ball club. While they sometimes had trouble scoring runs, the pitching featured starters Joel Horlen, Gary Peters, John Buzhardt, and a young 22 year old Tommy John. Hoyt Wilhelm had a stellar year with a 1.81 ERA. The 1965 team was a excellent ball club. They finished ------------- with a ------ record. Spoiler alert! I think the original poster requested not to post their record and standing. A major-league player for 10 seasons, Don Buford broke into the big leagues in 1963 with the White Sox after signing as a free agent with the team in November 1959. At only 5’7” and 160 pounds, Buford was a prototypical leadoff hitter much of his career. He always scored more runs than he batted in, including 99 runs scored for the Baltimore Orioles each season between 1969 and 1971. He stole 12 or more bases in eight different seasons, including 51 for the White Sox in 1966. He also led the league in being caught three times. His 93 career home runs demonstrate that he always had a little power, but he seemed to get stronger in the World Series; in 58 Fall Classic at bats for the Baltimore Orioles between 1969 and 1971, he hit an impressive four home runs. Between batting leadoff, his quick speed, and good situational hitting, Don Buford owns the distinction of being the most difficult major league player to double up: in 4,553 career at bats, he grounded into only 33 double plays. Although he also played a lot of left field and third base over the course of his career, Buford primarily played second base for the White Sox in 1965. He played in 155 games for the ’65 team, starting at second base 128 times and third base 15 times. Though known as a leadoff hitter, Al Lopez often put the switch-hitting Buford in the #2 slot in 1965. 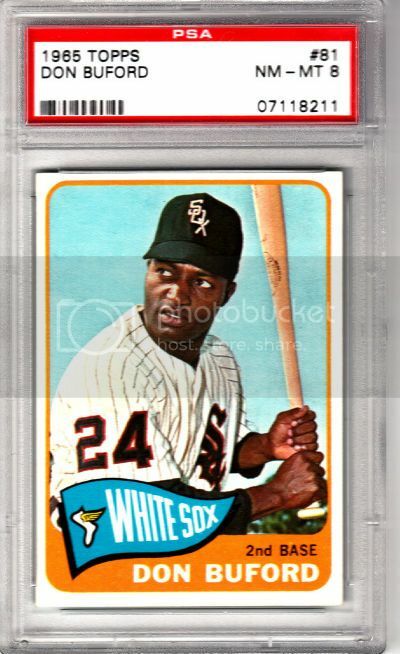 Buford’s 93 runs and 166 hits were tops on the White Sox in 1965, and his .283 batting average and .358 OBP was the best of any starter on the team. His .982 fielding percentage was also very respectable for an infielder. For his 1965 efforts, Buford garnered three MVP vote points, finishing in 25th place. His performance was apparently comparable to legend Mickey Mantle and teammate Floyd Robinson, both of whom also received three points. The season started a little later in the 1960s than it does now, and the White Sox had only played 10 games coming into their April 27th Tuesday evening contest with the Boston Red Sox. At 7-3 and with four wins in a row, the White Sox were tied for first with the Minnesota Twins coming into play. The Red Sox kicked off the scoring with a 2nd inning solo home run by Tony Conigliaro off John Buzhardt, but after that it was all White Sox. Although the ’65 team didn’t usually overwhelm opponents at the plate, when they did, Don Buford was probably involved. Buford went 4-5 with four singles on the 27th, scoring twice and picking up two RBI. The White Sox first run was on Buford’s first single of the game, a bunt fielded by Red Sox catcher Bob Tillman. Tillman promptly threw the ball away; Cater scored from first base and Buford advanced to third base. Buford’s first run put the White Sox ahead in the bottom of the third when he scored on a Pete Ward single. He added an RBI in the 4th on a single which scored Buzhardt. And in the 7th he helped put the game away. Buford led off the inning, singled, and scored on an error by second baseman Felix Mantilla. When Buford batting again, his single to right drove in Ken Berry, but the inning was ended when Danny Cater was thrown out at third by Conigliaro, who was playing right field. When it was all over, the White Sox had won 10-1, with five of their runs unearned due to three Red Sox errors. Buford’s four singles had directly or indirectly resulted in five runs. The Twins also won, and so the two teams remained tied for first place. 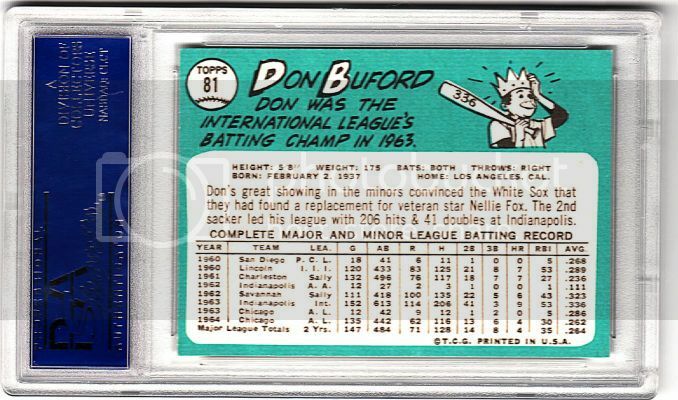 A child thumbing through his baseball cards on April 27th might have noticed Buford’s .336 average and 114 runs two years earlier for the Sox’ farm team and wondered whether he would replicate that production for the White Sox in 1965. BRDSR---This is my new favorite thread. Thanks for putting it on the board! All I will say is that in October of 1965 I enlisted in the USAF and every year that I followed the Sox up to that point, they were Pennant contenders and all I knew was Southside winning Baseball. By the time I was discharged in 1969 things had changed drastically. Look forward to reliving that season through your posts. Last edited by LITTLE NELL; 07-02-2012 at 05:52 AM. My eyes were of a child that year and they always saw hope. Now as a old man whose eyes has seen so many years, they see things so much differently. You must have really have looked forward to your Stars and Stripes paper! When I was stationed at Nha Trang Air Force Base in Viet Nam in 1968 I worked from 11pm to 7am and the Star and Stripes was flown in daily at 11am, I would get up at 1030am to make sure to get my copy to see what the Sox did and then went back to bed. 1968 was the first losing season I experienced as a Sox fan as I started following them in the early 50s. I was in the Navy a few years after you and stationed in Pearl Harbor. We were a west pact patrol DER. Went to Vietnam, China, Tailand, Phillipines, Japan, and Guam. I was always awaiting mail delivery while out to sea; looking for my copy of the paper. I’m one card away from completely finishing my first year, 1965, a 30-card set. I have a handful of Sox cards from 1965 (Gary Peters, Moose and Horlen). I love that design with the little pennant in the bottom corner w/ team name and logo. Someday if I hit the lottery, I'd like to build that entire set. Saw my first game as a five-year old in Comiskey in 65. Sox beat Boston. I think Horlen pitched. That's all I remember about the game except I sat along the right field foul line upper deck and was afraid of the height at first.